This month, Boxcitement got a bit – well – fruity. That’s right, the theme of the box was ‘Let’s get Fruity’ and its curated contents follow this brief. Think bold colours, fun motifs and juicy trinkets, all influenced by citrus, watermelon, kiwis and bananas. Bound to keep any subscriber happy, the theme works well as both appropriately summery and generically adorable. 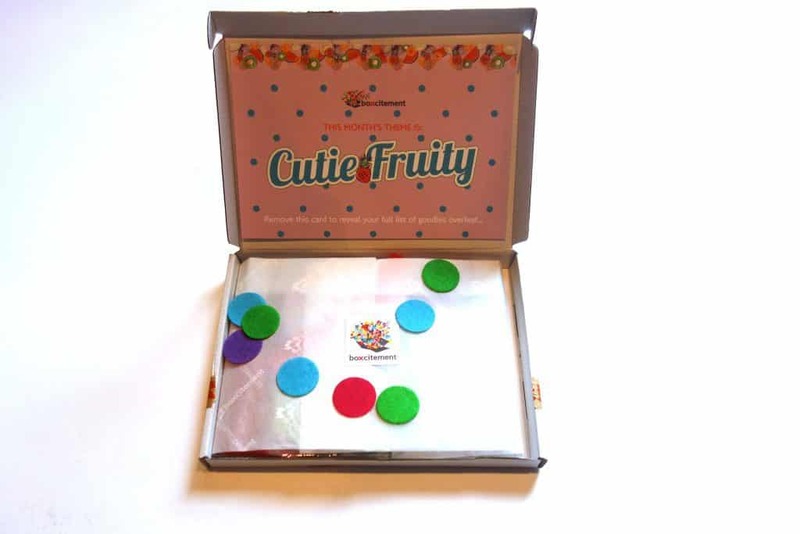 All items have been designed exclusively for Boxcitement, making this fruity collection a truly unique bundle. 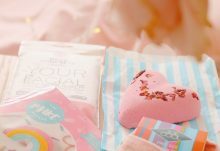 Boxcitement’s real selling point is the sheer amount and variety of items that are included in each month’s selection – it seems that the team manage to cram in more than physically possible into a small cardboard package. And, somehow, it still manages to fit through the post-box. There’s always a range of small, attractive and useful pieces that are perfect to add a bit of sparkle to anyone’s routine, whether it’s stationery, jewellery or prints. 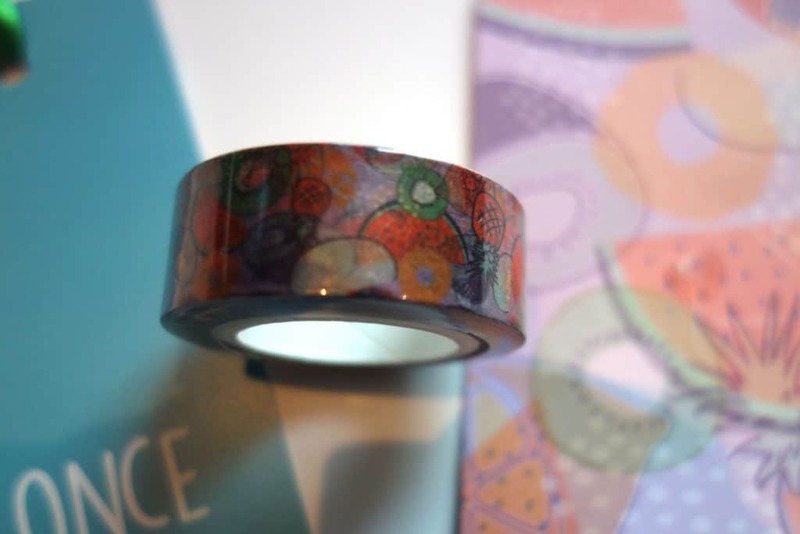 The first round of items include a paper bookmark, a roll of custom-designed washi tape and a necklace. 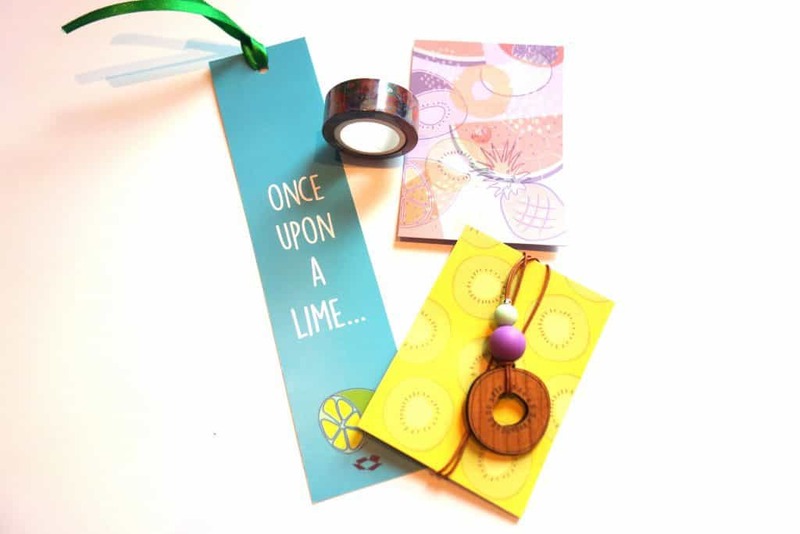 The vibrant bookmark is perfect to immediately slip into your current read (mine is The Handmaid’s Tale by Margaret Atwood and it’s doing the trick). This is the type of useful yet eye-catching piece that Boxcitement really excels at. The washi tape has a metallic finish and a fruity print that includes watermelon slices, kiwi and pineapples. I covet washi tape for crafts and choose it over boring sellotape for wrapping presents, so I go through rolls of this without much effort. The wooden kiwi necklace is a nice, easy summer piece in a long-length, perfect to pair with a floaty dress for hippy vibes. Another Boxcitement box means another solid collection of stationery. 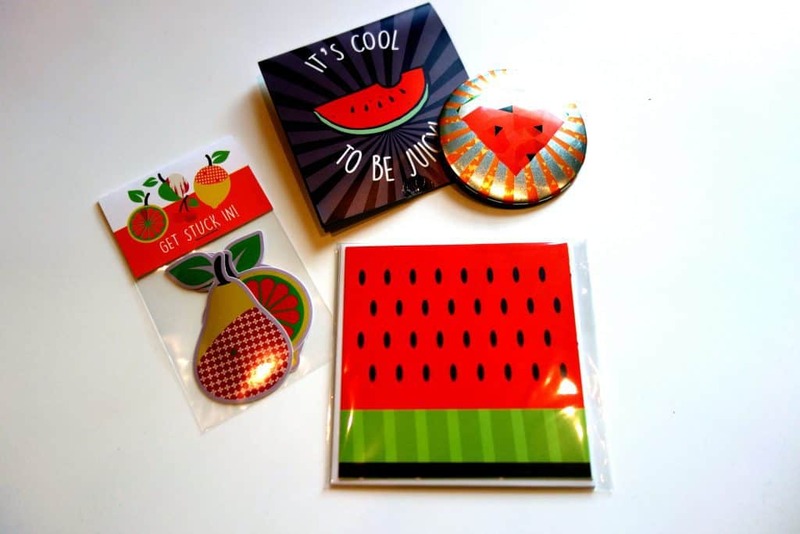 This month features a pack of stickers, a jumbo metallic watermelon magnet and a set of cards and envelopes. The stickers are amazing – colourful and cute – exactly my type of easily embellishment to spruce up a notebook. 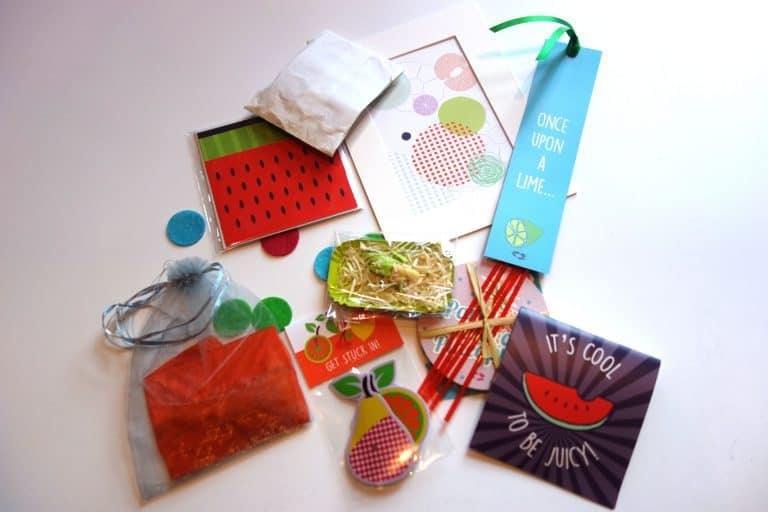 The watermelon magnet is a bold, metallic piece that will look good on the fridge, or on any metallic surface in the kitchen as I’ve discovered (it’s currently stuck to our metal IKEA shelving unit). The note cards are also punchy and fun; I popped one into my boyfriend’s lunchbox one morning – just a disclaimer here: it was a special occasion, I’m usually not that organised. 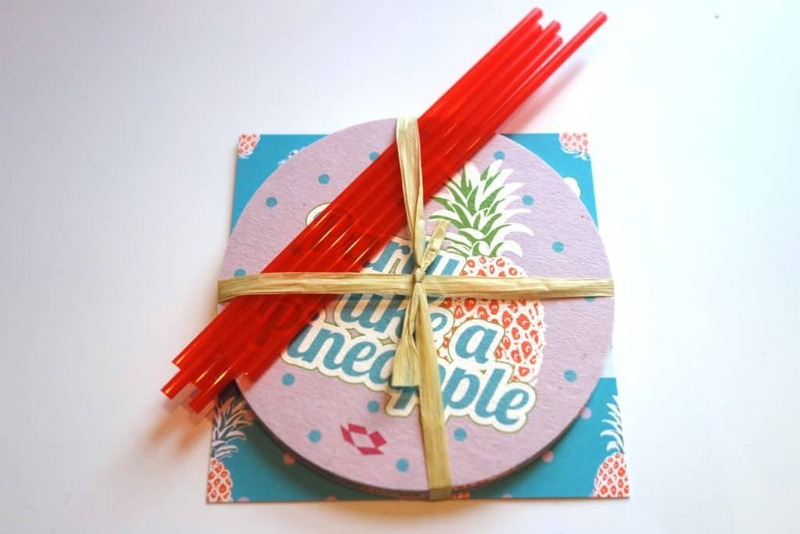 Yes, this is a fruit cocktails coaster kit. And if that weren’t cute enough, it comes with some drink recipes (it’s practical to boot). This would be a cute party favour and I’m plotting an occasion when I’ll have a chance to use it, but I have a belated baby shower on my horizon where this might make an appearance. 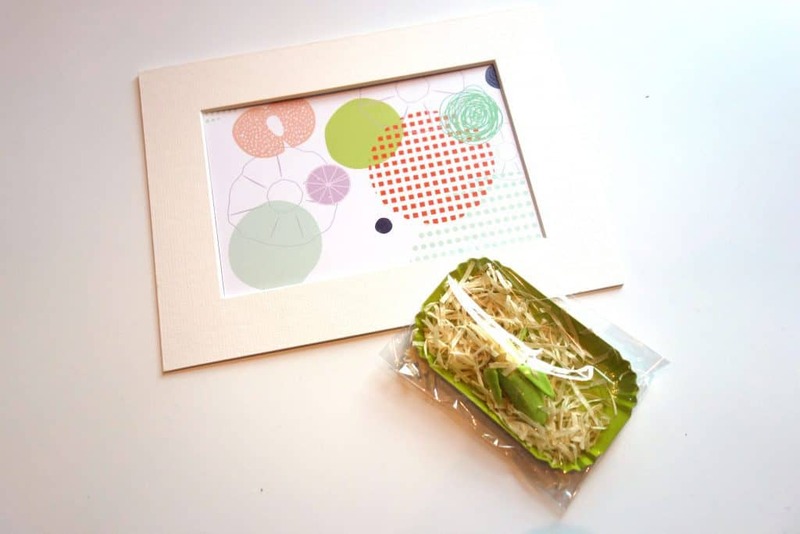 The final items this month include this modern print inspired by fruit and an miniature banana eraser. The print is mounted, so it can either be put into a frame or can be put on display as it is. The print is understated, but pretty colourful. Can we please talk about the tiny banana eraser, though? It’s nestled in a straw basket and so detailed (in a banana peel!) that I don’t have the heart to use it. This made me laugh and might secretly be my favourite contribution to May’s box. Boxcitement can be purchased as a one-off (£18), or as a subscriptions of three (£51), six (£96) or twelve month (£180) with P&P included. It can also be gifted, making it an easy present that delights for months to come. The monthly themes aren’t announced in advance, so every delivery is a guaranteed surprise. 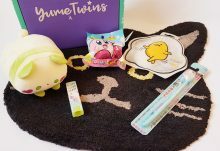 For this price, subscribers receive a sizable selection of curated items, giving them a lot to look forward to each month. Choc-full of surprises and occasionally a bit random, Boxcitement still keeps me delighted with its rainbow of fun – but inherently useful – pieces. A very fruitful (sorry) box from Boxcitement brimming with some eye-catching and unique items.